Discussion in 'Classic Menswear' started by suitforcourt, Aug 23, 2018. 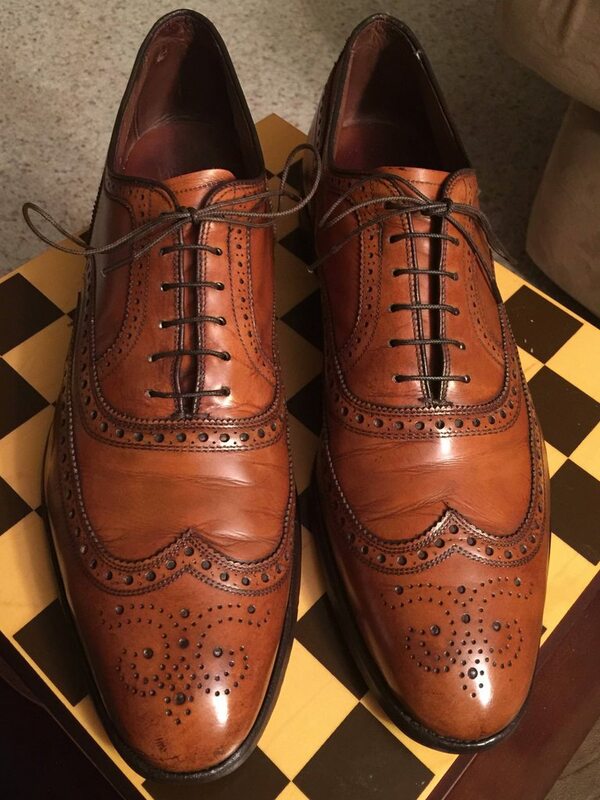 This is the official thread for submissions to the 2018 shoe revival challenge. 4. A separate thread will be created for voting. Your "like" on this page, does NOT count as a vote. So like away! 5. Participant must submit receipt showing price. Must be $15US or less (does not include taxes, gratuity, shipping and handling). Good luck to all. And have fun!!! In the vain hopes for a participation trophy, and to support the challenge, I will throw in my entry. Nunn-Bush LWBs picked up for $8. Stripped with Renomat, water reshaped, conditioned with Bick 4, polished with AE walnut in a tube, and several coats of wax at the end. My congrats to the eventual winners. 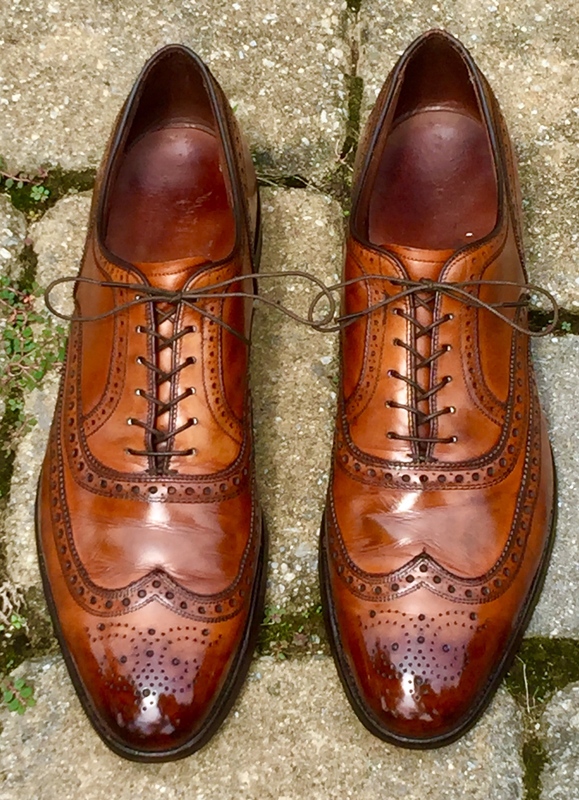 My official entry / submission for the 2018 Shoe Revival Challenge: 1984 Allen Edmonds McAllister, model 6265 - Chestnut Polished Cobbler (Corrected Grain). Overall, despite challenging moments (of darkness and despair), this was a really fun challenge and I hope it becomes an annual competition as it's really neat to see all the submissions. 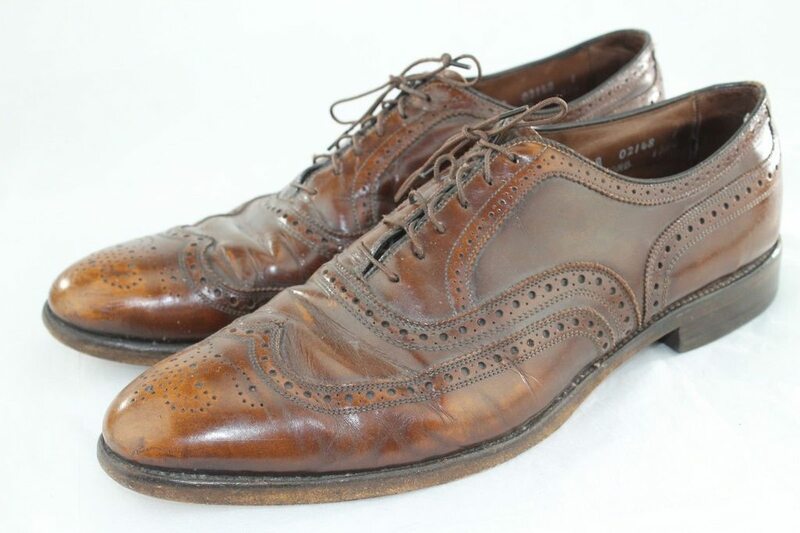 There are a lot of great old shoes that need saving. In fact, if suitforcourt, smfdoc and davidVC agree to make this an annual thing, next year I'll attempt a Corfam Restoration for great fame and glory (and possible chemical poisoning). Official Submission - The Correctobucks. Please see page 16 of the original restoration thread for full details. Sandpaper, Suede Dye and lots of love. I very much enjoyed this project and everyone elses work. Thanks @suitforcourt! 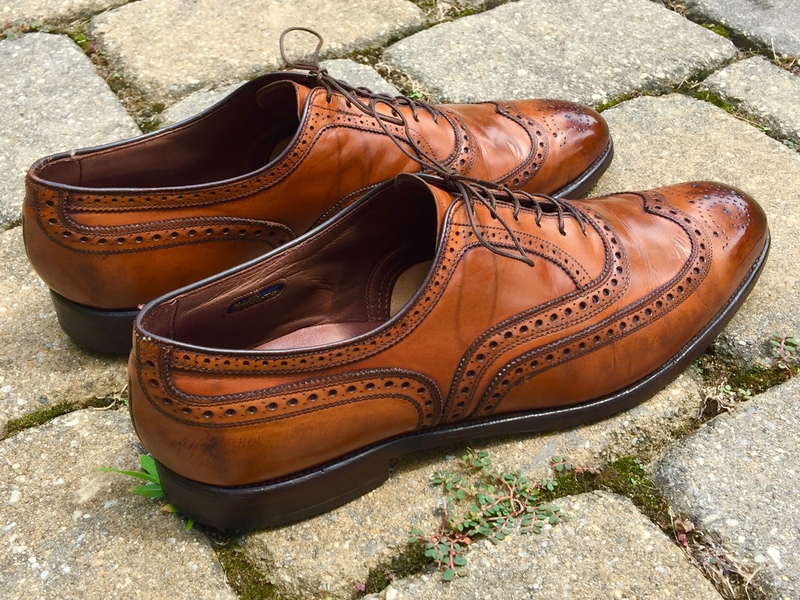 here are the pictures regarding the 'Dylan' Grenson. The story is in the other thread. The last 9 are the final pictures. 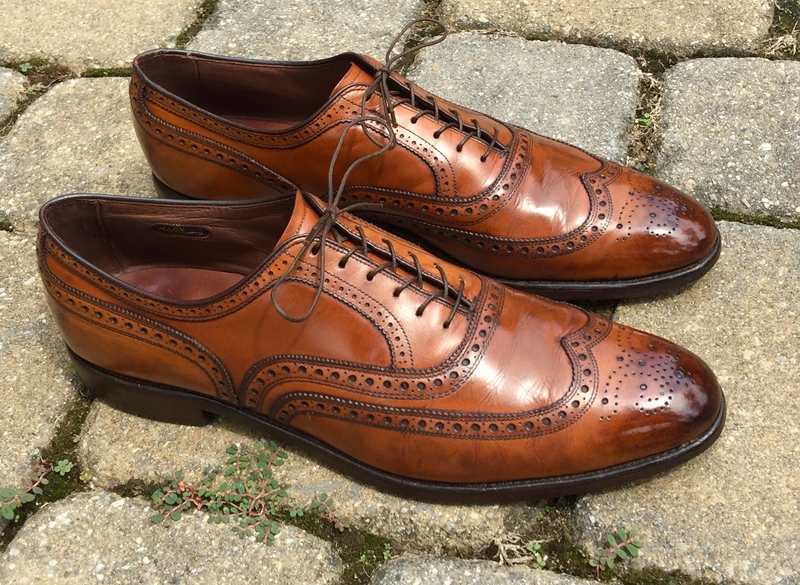 My contribution is a pair of Van Bommel, Dutch shoemakers since 17-something. 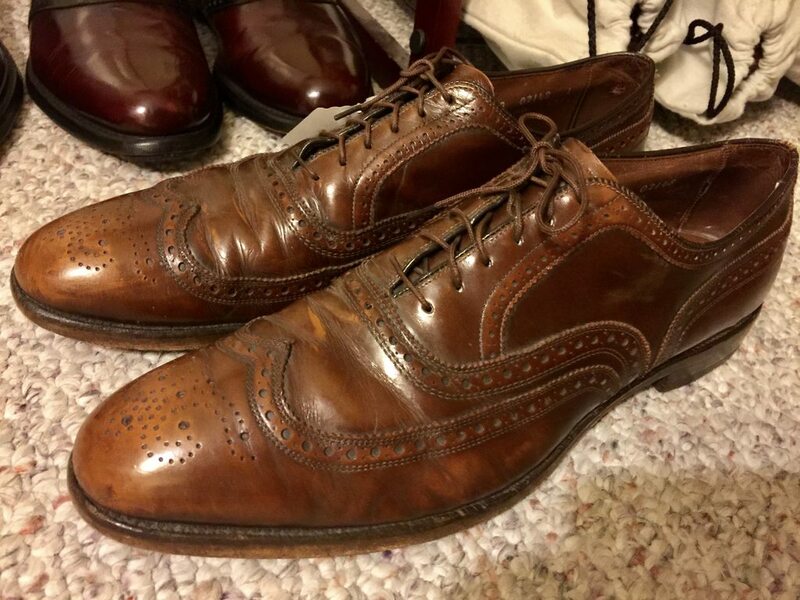 - Glycerin treatment, 4 days of letting dry with a shoe tree, this removed 90% of the creasing, they stay in shape without the shoe trees. - a single light coating of Saphir creme, I had to mix a few colours to get the right one. - a mirror shine, mixing bordeaux and dark brown. - heavily waxing heel and sole edge, almost glass-like shine on the heels. It might be more suited to a sleeker and cleaner style but I wanted to push the boat out. 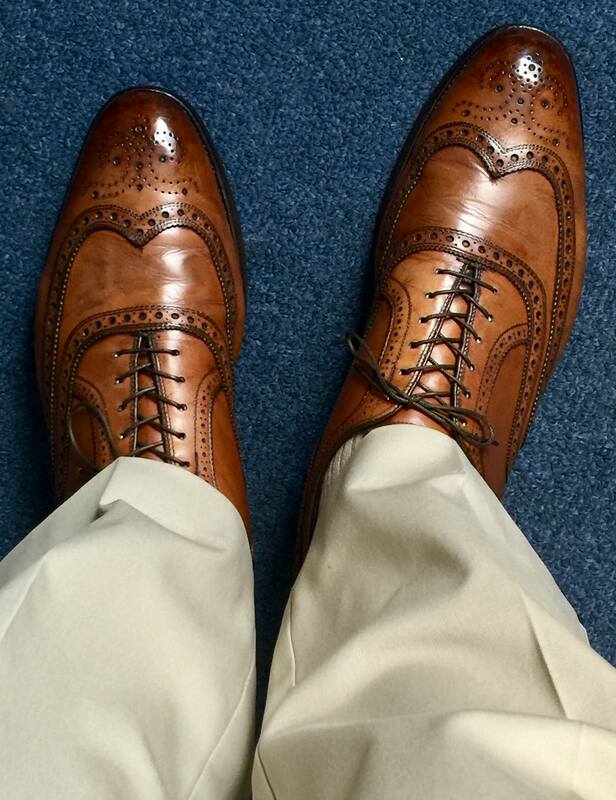 - lastly, new laces, I would have dyed and reused the old laces but they were different lengths! I enjoyed the process, the sanding took a good while. I can't wear these as they are to big for me, I bought these as 43's but they turned out to be 44,5....bummer. Before wearing they should be resoled! Please consider this as my official entry into the contest. I don't have a lot of shoe care products and only one brush so I had to make due with what I had. 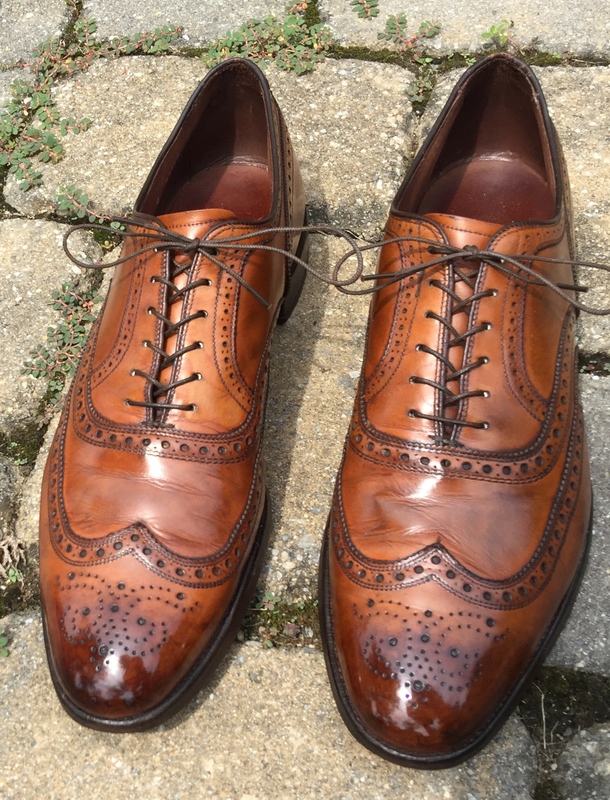 Worked the toe cap and the upper vamp with light brown wax then added some black for the middle piece and the brogue details. For some depth, I added hints of cordovan in the middle so depending on the light, you get red tint. 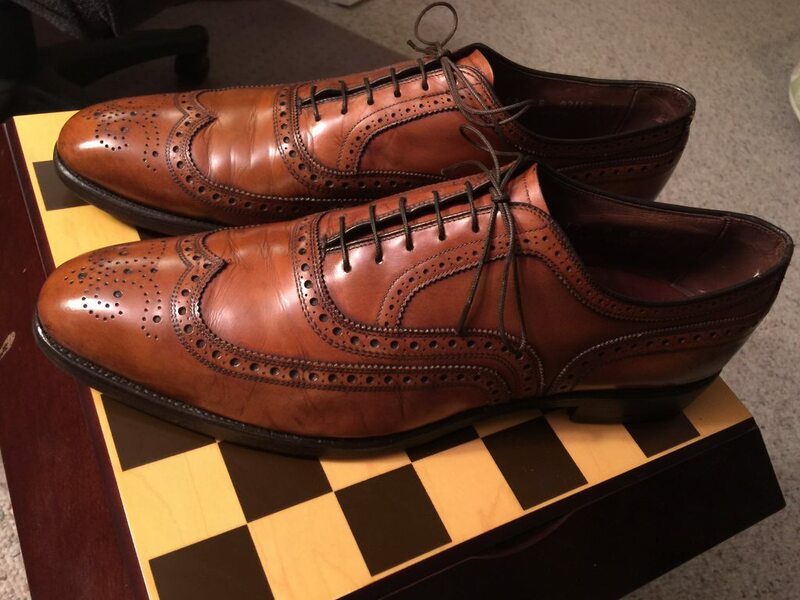 My entry - Crown Imperial black scotch/pebble grain longwings. Process - disinfect interior with lysol, alcohol, and very dilute bleach solution, wipe down and brush exterior, clean exterior with lexol cleaner, use toothbrush+lexol to clean welt, hit exterior with reno'mat, condition with lexol conditioner, submerge for 1 hour in water, let dry swapping out shoe trees twice on day 1, then once a day for two more days, further smooth creases with back of warm metal spoon, wrap in glycerin soaked rags overnight, let dry three days, sand sole edges and apply black edge dressing, two rounds of Bick 4, followed by brushing/black polish then a round of Collonil 1909 and buffing. 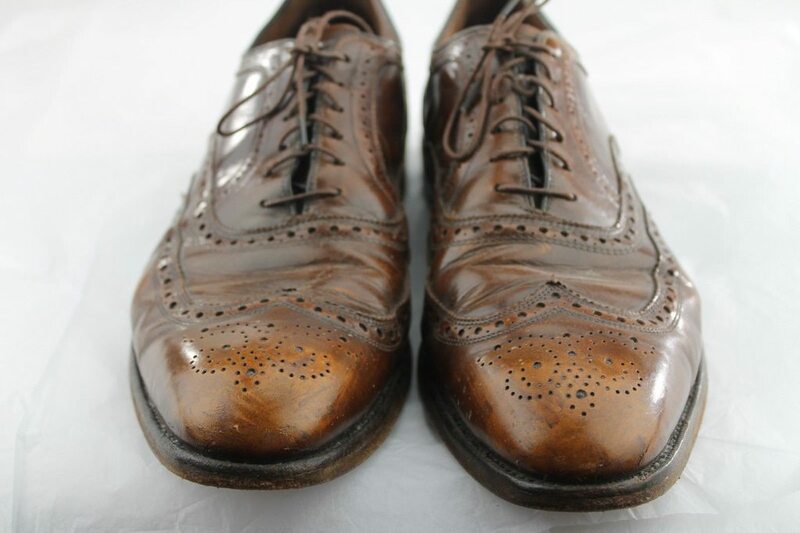 Florsheim 93603 PTB, manufacture code of KA, so I'm assuming manufactured in 1980. 1. Clean inside with anti-bac wipes, followed by UV treatment. 2. Clean welt with Lexol Cleaner and toothbrush. 5. Not satisfied with results in step 4 so used denatured alcohol (methylated spirits) to clean upper. 6. Sand sole and heel edge to clean using 60, 100, 150, 220 and 320 grit sandpaper. 12. Touch up heel piping with black crème polish. Good luck to all of you and carry on gentlemen. This has been fun. Old pair of To Boot New York that were soiled, dried, crushed and ready for the trash heap. 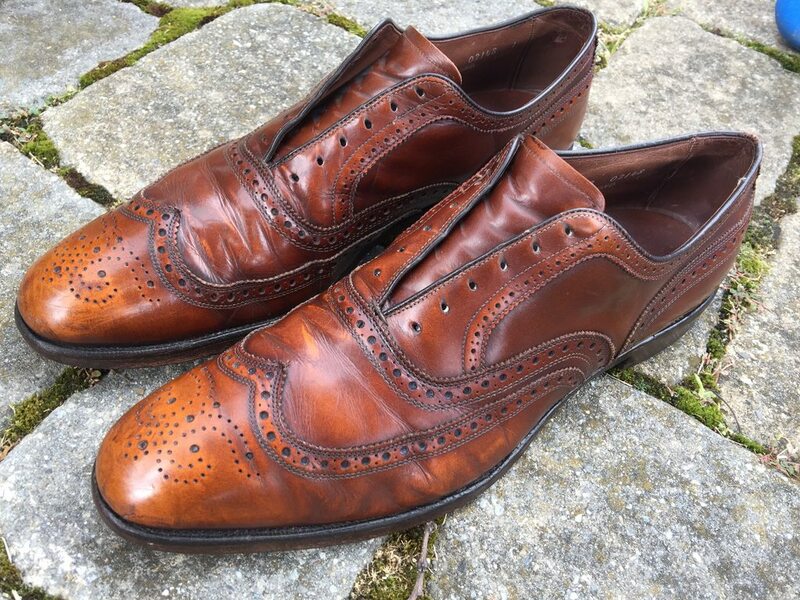 I brushed them vigorously then I treated them with copious amounts of Venetian shoe cream and washed them with saddle soap. I honestly don't remember if I used fiebings deglazer on these or not. I may not have bothered since the original finish was completely nonexistent. I dyed them with Fiebings buckskin as a base coat x 3 and used Fiebings black for the antiquing x 2 or 3. There were numerous rounds of dye with venetian shoe cream for rubout between coats. I used meltonian light brown cream polish and Saphir medium brown wax polish all over with Saphir mirror gloss on the toes and heels. This mirror shine took quite a bit of time since the leather was so rough. First 3 pictures are straight from ebay, the last is on the "workbench" after treating the leather. First Good picture is after dye and cream polishes but not the mirror gloss. Final pics are outside after mirror shine. Since there had been some statements on instagram about this being a fake restoration, the last pic shows the rubber soles which are very worn, so not a new pair. This was a very enjoyable project and I feel it really helped me to hone some of my skills. I will definitely continue my restorations!! Competing just in spirit. Didn't make the time to really spruce these up. 7. Dark brown Kiwi wax. I sanitized them. Cleaned with Lexol and isopropyl alcohol. Bick4 and some glycerin. Then a bleach bath to remove more color. Then the dye deglazer. Then Spice dye from Angelus. 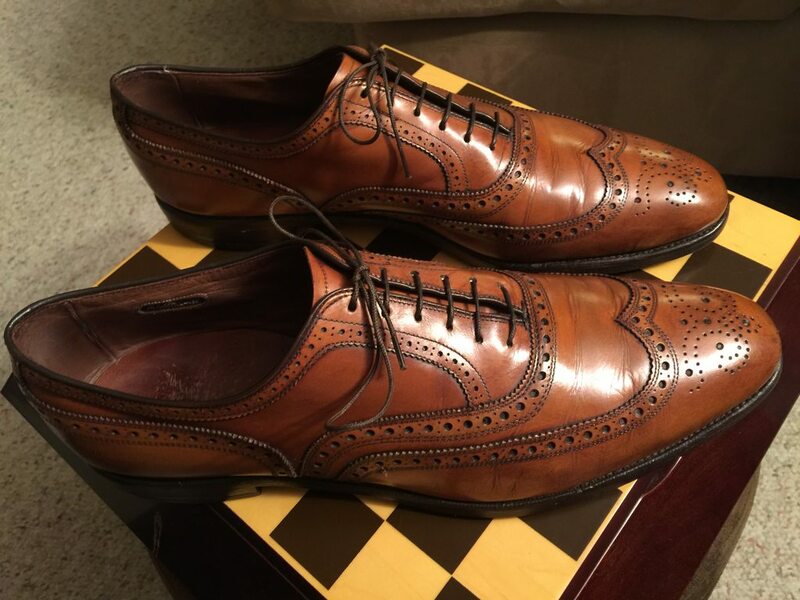 Going for a Florsheim Imperial Kenmoor 93633 Forest Green look. Edge dressed them in spice green, polished them, and added orange laces. Here we go, last and final touches are done. 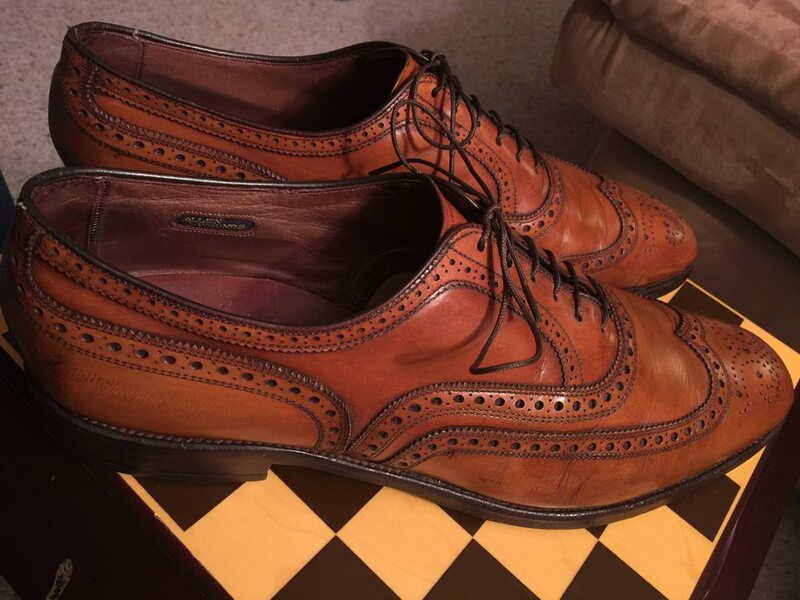 Florsheim 93602s that were in...less than ideal condition for wearing. Steps abbreviated for ease of reading. Edit: Last photo added to show color difference inside vs outside. 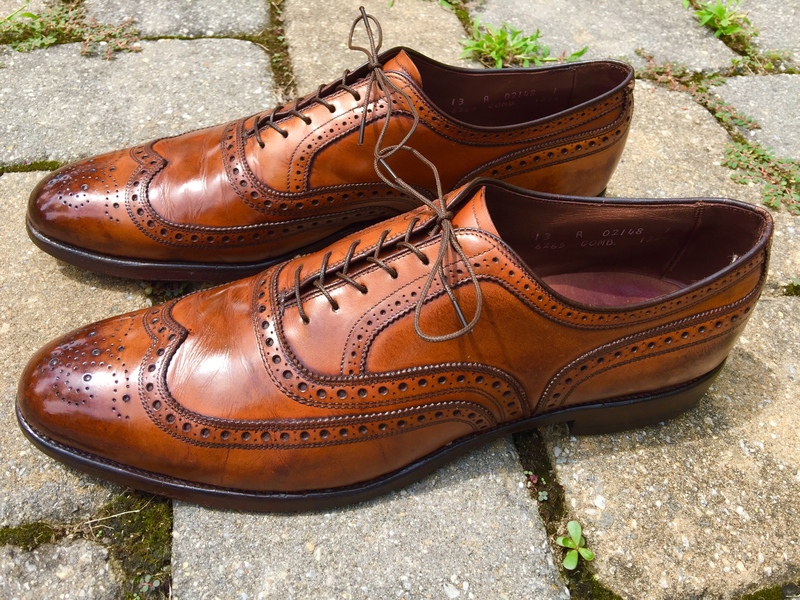 Gahhhh, the deadline came up fast and I didn't get a chance to do everything I was hoping to do to this pair of vintage Alden x Brooks Brothers shell PTB's. Had I not slacked, I would have sanded down and re-stained the soles and re-painted the eyelets black. As you can see, there was not much I could do with the cracks in the hide, and believe me, I tried numerous methods. Still, not bad for a pair of $1.70 shoes. Hi all - my official submission. This is a Haig & Dunn Custom Grade vintage vcleat, which was one of four pair completed for the challenge. My intent was never to do four pair, but had multiple eBay offers unexpectedly accepted resulting in all four pairs coming my way. It was hard to pick, but ultimately went with these since it was the first pair completed and couldn't decide between these and the AE MacNeils which turned out very similarly. The picture below really highlights the blending I was going for on the toes for adding some black "burnishing"
A special thanks to @suitforcourt for thinking of and organizing this event - it has been fun to participate and see all of the outstanding transformations from all of the participants!